Russia continued to conduct a limited air campaign likely designed to set conditions for a coordinated pro-regime offensive against opposition-held districts of Aleppo City. The Russian ‘Admiral Kuznetsov’ – an aircraft carrier carrying a contingent of Su-33 and MiG-29K/KUB fighter jets allegedly equipped with precision-guided munitions – arrived off the Syrian Coast on or around November 9. The ‘Admiral Kuznetsov’ and its battlegroup of missile cruisers and up to three submarines equipped with ‘Kalibr’ long-range cruise missiles will reportedly conduct ‘training exercises’ in the waters between Cyprus and Greece from November 10 – 15 and November 17 – 22. [i] Russia will likely use the ‘training exercises’ to obscure an aggressive assault on Aleppo City that leverages the Kuznetsov in a projection of force against “terrorism” and thereby bolsters domestic support for its operations in Syria. The carrier, however, will not likely provide sufficient military capability to achieve an immediate victory for Syrian President Bashar al-Assad in Aleppo City; rather, Russia will use the escalation in support of a long-term strategy to render the city uninhabitable and depopulate its opposition-held districts. Russia used its air campaign to target core opposition terrain in Idlib Province and Western Aleppo Province in advance of the carrier’s arrival, hindering the movement of opposition forces vying to reinforce besieged Aleppo City. Russia also conducted targeted airstrikes in support of pro-regime forces on the southwestern outskirts of Aleppo City after opposition factions launched a new operation to break the siege of the city on October 28. Although limited, these strikes blunted the opposition offensive, preserving the siege and rendering opposition-held districts increasingly vulnerable to the upcoming escalation. 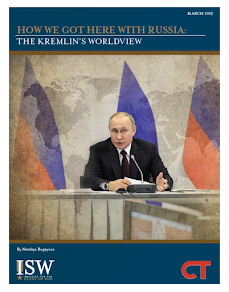 In advance of the expected escalation in Aleppo City, Russia also continued to cultivate the false perception that it is intervening in order to defend civilian populations in regime-held western Aleppo City against aggression from the opposition. Russian Minister of Defense Sergey Shoygu accused opposition forces on November 1 of regularly targeting “peaceful civilians” in Aleppo City since the start of a series of humanitarian pauses twelve days before, stating that “prospects for the start of a negotiation process” to end the Syrian Civil War have been “postponed for an indefinite period” due to the ongoing attacks. In effect, Russia conditioned the resumption of its air campaign in Aleppo City on the basis of a red line that the opposition had already crossed, highlighting its continuing efforts to portray its operations in the city as a legitimate response to opposition provocation. With this purported justification in hand, Russia will likely exploit international focus on the recent U.S. presidential election in order to renew concerted efforts to force the ultimate surrender of opposition groups in Aleppo City. 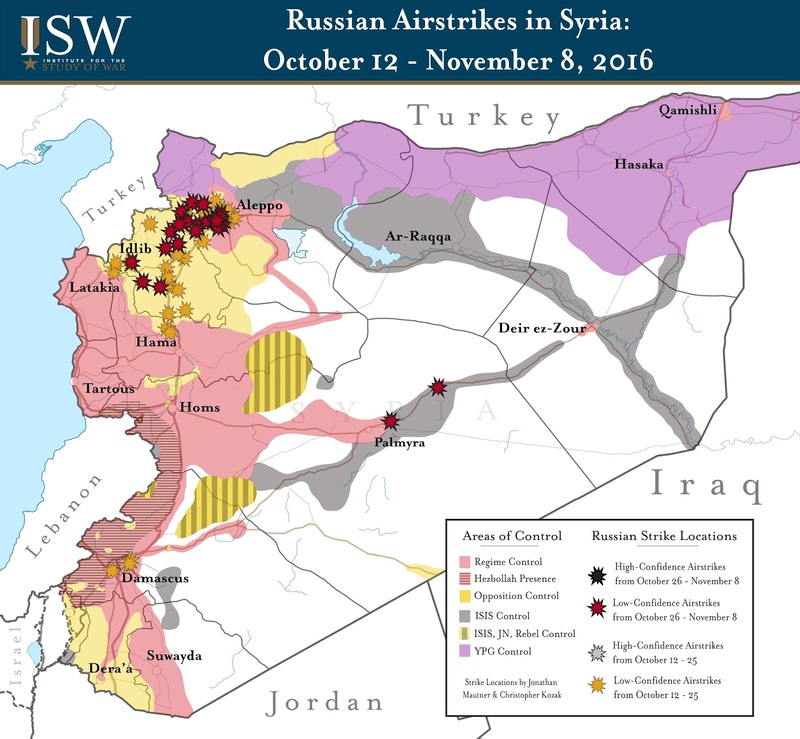 The following graphic depicts ISW’s assessment of Russian airstrike locations based on reports from local Syrian activist networks, statements by Russian and Western officials, and documentation of Russian airstrikes through social media. This map represents locations targeted by Russia’s air campaign, rather than the number of individual strikes or sorties. 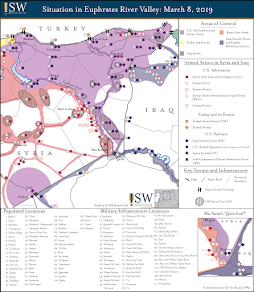 ISW was unable to assess any Russian airstrikes in Syria with high confidence during this reporting period.